At Computex last week, Seco was showing off its SBC-B47-eNUC board that’s based on Intel’s NUC (Next Unit of Computing) form factor. NUC type of devices have proven to be fairly popular with companies like Gigabyte, MSI, Asus and ASRock among others having jumped on the trend. However, Seco’s solution is quite different as it’s using a Snapdragon 410E SoC rather than an Intel based processor. It’s a rather odd board as far as connectivity goes and Seco seems to have some conflicting information with regards to some features between its website and the product information that was available at the show. It’s not 100% clear if the Adreno 306 will output at 1280×720 or 1920×1080 for example, and the board might have one or two I2S interfaces. The addition of mini SIM support seems odd as well, as there’s no obvious place for a data card. 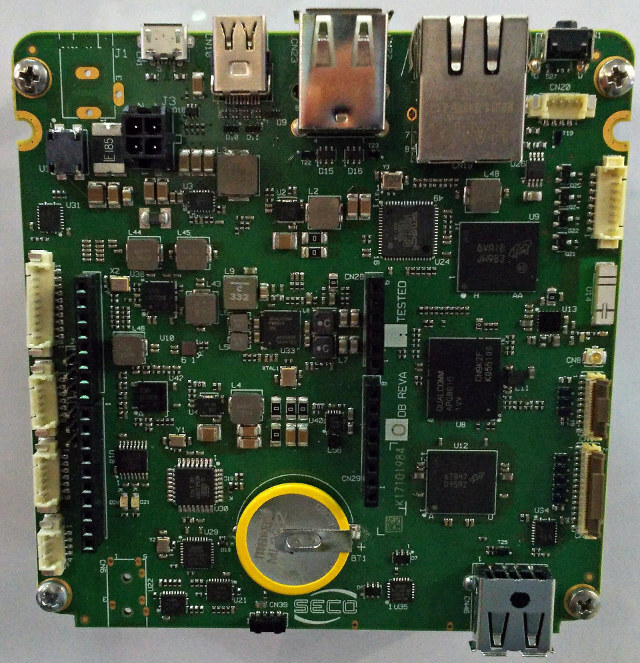 Seco is targeting the board for home automation, robotics, digital signage and human machine interface applications, but it seems like the (embedded) NUC form factor is not the best fit for most of these applications, as you can get more compact boards with similar features. There was no word on pricing and the board is still listed as under development on the Seco website. @Mike Schinkel No support in the SoC.